Ukraine’s President, Viktor Yushchenko, in a highly controversial act, removed from office one of Ukraine’s Constitutional Court Judges. The Constitutional Court is currently considering an appeal against the President’s decree dismissing Ukraine’s democratically elected parliament. The President’s removal from office of one of the judges reviewing his decree raises serious concerns of possible corruption and subjects the Office of the President to allegations that the President’s actions were politically motivated and direct interference in the decision and determination of Ukraine’s Constitutional Court. One of the identified problems with Ukraine’s judicial system is the concern that Constitutional Court Judges are paid monthly 60000 UAH (Approximately US$12,000) substantially large salaries by Ukrainian standards. The ability for a Judge to be replaced at will subjects the court to undue political pressure and leaves the court open to allegations of political corruption. This situation would not be allowed or tolerated in any other western democracy. The President’s decision to remove one of the judges has the potential of influencing the outcome of the Constitutional Court’s ruling on the President’s decree and the appeal by the Parliamentary majority and seriously undermines confidence in Ukraine’s judicial system and the Office of the President. Syuzanna Stanik: The president`s decree of 1 May dismissing her lacks the observance of a necessary procedure, according to the law on the Constitutional Court and the court`s procedures, the issue of breaching the oath should first be considered by a special commission which should forward its conclusions to the Supreme Council. The constitutional court currently is reviewing the legality of Yuschenko’s April 2 order dissolving parliament. The legislature, led by Prime Minister Viktor Yanukovich, has continued to meet in defiance of the order. Legal officials in the Yushchenko administration criticised Pshenichny earlier this month for talking to media about the case. Political analysts believe the court to be closely balanced between supporters of Yushchenko and Yanukovich. By constitutional statute the President appoints six members of the court, parliament another six members and an independent judicial council the last six members. Pshenichny was appointed in 2003 by Yushchenko’s predecessor Leonid Kuchma and is a likely supporter of Yanukovich’s pro-Russia policies, Ukrainska Pravda magazine reported. “This step by the president has the goal of stopping work of the constitutional court, the only organ capable of resolving the constitutional basis of relations between the branches of power,” Yanukovich said, in a statement published on his party web site. “We resolutely protest . this illegal measure by the president . and call on Ukrainian citizens and world society to bring an end to such actions,” the statement said. Reaction by parliament on Tuesday was slow in coming, in part, because May 1 is a national holiday on Ukraine. Ukrainan legal authorities were divided on whether the president could sack a high court deputy and appoint another to a particular case. Yushchenko’s office was on Tuesday not commenting on possible nominees to replace Pshenichny. Parliament on Monday muddied the constitutional waters as well, passing a law scheduling parliamentary and Presidential elections for December. Yushchenko’s April 2 order originally set elections only for parliament on May 27, but in a later order the pro-Europe politician changed the date to June 24. He has refused even to consider Presidential elections before the end of his five-year term in 2009. Long accused of doing little to stand up to an increasingly assertive pro-Russia majority in parliament, Yushchenko since the beginnning of April has taken the offensive, using presidential order and frank threat to challenge Yanukovich’s ruling coalition. Ukraine’s secret police, the SBU, a spy agency thought to be loyal to Yushchenko, in early April sensationally accused constitutional court justice Susana Stanik of accepting up to 12 million dollars in bribes, in exchange for her support to Yanukovich’s side in the parliament dissolution dispute. Stanik, while admitting her mother-in-law recently received as gifts a pair of Kiev apartments and other benefits from the Yanukovich government worth millions, has repeatedly denied the property transfers would have an effect on her fair judgement of the president-parliament dispute. Mykola Poludeny, a top Yushchenko legal advisor, in a Monday evening interview on the Channel Five television station repeated the allegations against Stanik, telling viewers Yushchenko was preparing to remove her from the court as well. Stanik, like the sacked Pshenichny, was appointed to the high court by Yushchenko’s predecessor. The ongoing power struggle between Ukraine’s President, Viktor Yushchenko, and the parliamentary governing majority continues unabated with the Parliament today passing a resolution calling for the holding of fresh presidential and parliamentary elections to be held no later then December 2007. This move comes following the President’s second decree issued on April 26, which annulled the fist decree made on April 2. The President has once again decreed that Ukraine’s democratically elected parliament be dismissed for the second time. The President is seeking fresh parliamentary elections to be held on June 24. 160 members of parliament have lodge an urgent appeal in Ukraine’s Constitutional Court claiming that the President’s second decree is also unconstitutional in that it does not comply with the provisions of Ukraine’s Constitution and that the President has exceeded his authority in dismissing Ukraine’s democratically elected Parliament. Ukraine’s current Parliament was elected in March 2006 in what was universally recognized as being a fair and democratic election. The existing Governing coalition was formed in July 2007 following the collapse of the Orange coalition at the beginning of July 2006. The President has expressed his concern that a number of politicians belong to his own party “Our Ukraine” and that of Bloc Yulia Tymoschenko have crossed the floor to support the governing coalition. Yushchenko is calling for fresh parliamentary elections in order to restore party discipline within his own party and that of the opposition. There are a number of legal questions surrounding the President’s decree not the least being that Ukraine’s constitution does not and is not responsible for the maintaining party discipline and support within the various political groupings. On April 19, PACE adopted a report and passed a number of resolutions pertaining to the current Ukrainian political crisis. The European Assembly in particular criticized the “Imperative mandate” provisions of Ukraine’s Constitution stating it was not the norm of a democratic society or the role of a countries constitution to enforce party solidarity. It is the Imperative mandate provisions that the President of Ukraine is trying to rely on in his determination to dismiss Ukraine’s Parliament and prevent the Government from receiving a constitutional majority of the elected parliament. PACE called on Ukraine to scape the Imperative Mandate provisions from Ukraine’s constitution and for all parties to abide by the ruling of Ukraine’s Constitutional Court. The President’s second decree, cancelling his first decree, was seen as a tactic adopted by the President to try and avoid Judicial review of his first decree by Ukraine’s Constitutional Court. If Ukraine’s Constitutional Court ruled that his decree was unconstitutional and as such illegal then the president would have been under considerable pressure to resign. By cancelling his first decree the President hopes to provide cause for the Court to abandon its original hearing and having to start over again, prolonging and exacerbating the current political constitutional crisis. The Government in response to this latest maneuver by the President has called for the president to face the people of Ukraine in joint Parliamentary and Presidential elections to be held later this year. During the weekend the president fronted a political rally organized by the parliamentary opposition in support of fresh parliamentary elections. The President rejected the proposal of holding fresh Presidential in conjunction with fresh Parliamentary elections. 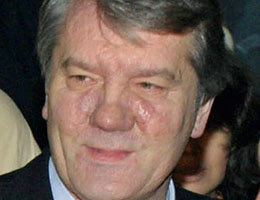 Viktor Yushchenko has been criticized for his public stance citing that his attendance and participation in the oppositions political rally has compromised the office of the President who is supposed to act in the best interest of all of Ukraine and not just his political party who is also part of the opposition forces. A recent opinion poll by Sotsis social and political study centre shows that Ukraine’s Prime Minister, Viktor Yanukovych (45%), is the most trusted politician 13 percentage points above Ukraine’s President, Viktor Yushchenko (32%), and 12 percentage points ahead of Yulia Tymoshenko (33%). You are currently browsing the Ukraine Today blog archives for April, 2007.